Margate is a perfect setting for a piece of British miserablism. The backdrop of the grey English seaside resort combined with the naffness of Dreamland, arcades and rotting lidos seems perfect for a sombre coming-of-age story tinged with elements of bittersweet comedy. But, like an actual trip to Margate, Jellyfish is only likely to leave you feeling pretty bummed out. 15 year old Sarah (Hill) has a lot on her plate, looking after her younger siblings while her mother (Matthews) spends her days in bed, wracked with depression, leaving Sarah as the sole breadwinner of the family. At school, her drama teacher (Nri) recognises that she has a talent for insults and pushes her to write a stand-up comedy routine for an upcoming showcase at a local theatre. Though she initially snorts at the idea, Sarah eventually finds solace from the chaos in her life through planning her routine. However, as things spiral ever-out-of-control at home and work, something eventually has to give. 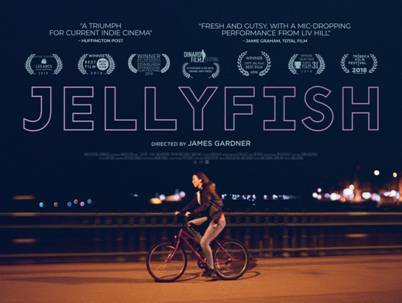 The set-up is solid and though James Gardner directs his debut feature confidently, Jellyfish doesn’t quite deliver on its interesting premise and thus feels like a missed opportunity. Though there are some humorous moments, the quirkiness is ultimately suffocated by the unrelenting grimness of Sarah’s life. The film’s inability to marry the comedic and the dramatic leads to a confusing tone and if it were more focused, it would have likely brought a more defined performance out of its young star. Sarah supplements her income by giving procedural-like sexual favours to some of the creepy old men that frequent the arcade she works at. This is initially played for laughs, but eventually leads to the film’s most intentionally uncomfortable moment, which is shot in an interesting manner that doesn’t quite feel as effective as it wants to be. There’s a similarly uncomfortable scene involving Sarah seducing a man in a club so that she can rob him, that just takes up too much time in a film that already feels like it could do with being fifteen minutes shorter. There are some decent performances here, particularly from Matthews and Nri, but the whole thing doesn’t come together to form a cohesive whole. When the climax eventually rolls around, there’s a sense that this should be where everything ties together, but it doesn’t quite feel earned somehow and you’ll wish that the film had spent a bit more time with Sarah working on her comedy act. 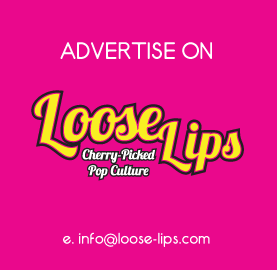 This entry was posted on Sunday, February 10th, 2019 at 8:25 am	and is filed under Features, Film, Review.